MORRISVILLE, N.Y.—Need help creating a resume, cover letter or preparing for an interview? 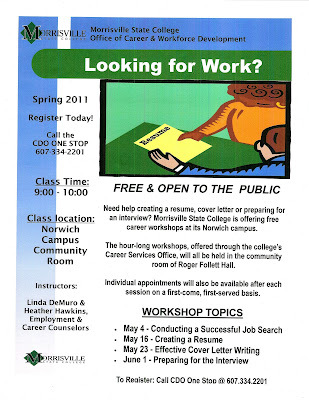 Morrisville State College is offering free career workshops at its Norwich campus. The hour-long workshops, offered through the college’s Career Services Office, will all be held in the community room of Roger Follett Hall. Individual appointments will also be available after each session on a first-come, first-served basis. The following workshops are being held from 9 to 10 a.m.
To register for the workshops or to schedule an individual appointment, call the CDO One Stop at 607-334-2201. Morrisville State College’s Norwich campus is located at 20 Conkey Ave., adjacent to the Eaton Center in downtown Norwich. Morrisville State College sets the world in motion for students. Curriculums are enriched with applied learning and pave the way for opportunity at both the Morrisville and Norwich campuses. An action-oriented, interactive learning lab, the college is a national leader in technology. Visit www.morrisville.edu to experience, Morrisville in motion. Join us on Wednesday, May 25th from 5 pm to 7 pm for an after hours networking event and membership drive. Membership dues— $35 for the year ! This will give you access to all of the benefits TCYP has to offer. Cost to attend: $15 for non-members & $10 for renewing members. Renewing members will receive a coupon for a free drink and will also be registered to win a Resort Vacation for a Week! If you can bring the most new recruits to this events, you will win a $25 gift certificate to Mama Nina’s Pizzeria! For more information, contact Sara Boulanger: 607.432.7003 or email sboulanger@uscny.edu. Thank you to our speakers, Paul Adamo, Tara Collins and Mike Stein! The Leatherstocking AEA program featured an engaging discussion about defining fund development and marketing in nonprofit operations, including their overlap and how to improve the partnership in these two areas. The presentation began with Paul Adamo, Vice President for College Advancement and Executive Director, College at Oneonta Foundation. In Paul's presentation (available here), he discussed his key fundraising factors and tips, as well as how marketing is involved. You can watch Paul relate his fundamentals here. In this video, Paul asks participants why people should give their nonprofit money. Lastly, Paul stresses the importance of your board in fundraising in this video. The second portion of the program featured Tara Collins, Communications Director at Watershed Agricultural Council. In Tara's presentation (available here), she defines marketing and relates about the importance of marketing strategy. Watch here as Tara defines and stresses marketing strategy. Watch here as she elaborates on strategy and shows an example from Watershed Agricultural Council. Her presentation also addressed how to make the most of your efforts, and includes a number of linked resources. The final portion of the program featured Mike Stein, Vice President of Development at Bassett Healthcare Network, discussing the partnership between marketing and fund development. He discussed how they often seem to compete with each other rather than build on their partnership. His suggestions for this issue included bringing both sides together through a planning and implementation, as well as ongoing communication. He also stressed recognizing the different goals fund development and marketing have, and figuring out the commonalities. Thank You Again To Our Panelists! The Daily Star reported that St. Mary's School will close in June. Parents of students who attend the Oneonta private school were notified by mail Saturday of the closure. The Rev. Joseph Benintende, pastor of St. Mary's Church, announced it to parishioners at masses during the weekend. "This all came down on Friday," St. Mary's School Board member Jo-Ann LaMonica said Sunday. "Everything happens for a reason and as devastated and heartbroken as I am over this, there has to be a reason." The closure means about 50 students in kindergarten though sixth grade must seek enrollment in a new school. It also means the end of pre-kindergarten and 3-year-old programs that serve another 50 children. The school employs 14 full-time staff and nine part-time staff who will lose their jobs. Read more here. USC the Business College has received a grant to provide “Free” Cybersecurity training for employees and individuals in the Otsego and Chenango County areas. This is a 4 day class being held on Saturdays at the USC Computer Lab in Oneonta. The "intermediate" class is titled: "Fastlane to Cybersecurity Program". When a person completes that program...attends all of the sessions...USC awards a certificate and a 500GB portable hard drive. Space is limited, as the computer lab can hold 20 students. FastLane to Cybersecurity: Intermediate level candi­dates will do networking, assessing and handling security risks, hardware components, etc. This course is for the advanced user who is seeking to improve basic IT knowledge. Participants taking this course will broaden their computer skills and ideally become the go-to person in the office or employment set­ting. INTERMEDIATE ("Fastlane to Cybersecurity Program") offered on Saturdays: 4/30, 5/7, 5/14, 5/21, 8:30am to 4:30pm at USC the Business College, 17 Elm Street, in Oneonta. 1. Please have the training candidate call 315-334-7780 for a short IT assessment to ensure this is the class best suited for the individual. 3. Candidate will be contacted with final instructions for attending the program.